The phrase “You know it’s ______ when _____” is often used to indicate an obvious comparison. So, “you know its fall in Japan when you see the kaki in stores and shops” is perhaps the best way to start when talking about kaki, or Japanese persimmons. The Japanese have an unwavering affinity and reverence for the changing of the seasons and all that the passing of them entails. Kaki are ubiquitous when in season and appear in supermarkets, fruit stands, restaurant menus and even seasonal retail food products. They’re very affordable compared to other fruits and while highly nutritious are also very tasty. At the same time, to the uninitiated they are often misunderstood. In Japan persimmons trees which are native to China and other mountainous parts of east Asia, are a very big part of horticulture, and more importantly, agriculture. They were originally brought to Japan over 1,000 years ago. 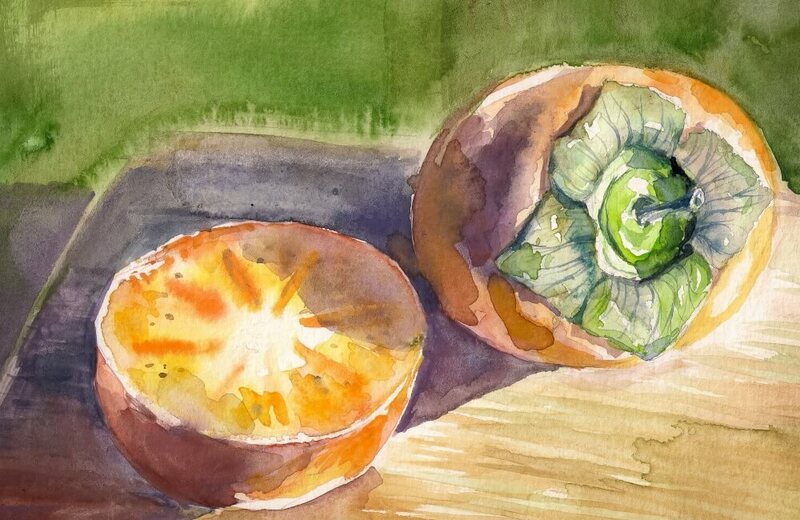 In Japan, as a harbinger of autumn, kaki seem to conjure up thoughts of all the delicious foods to come with the season. 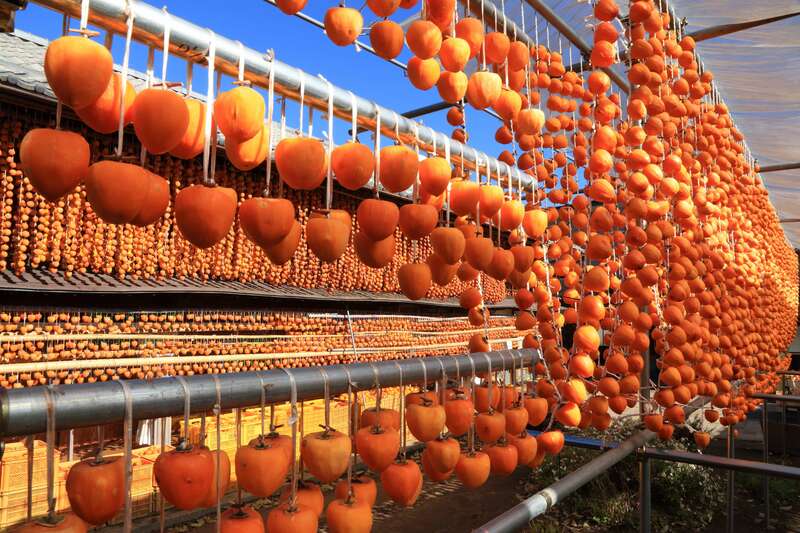 There are two main types of persimmon available almost everywhere in Japan. The varieties known as shibugaki in Japanese, are oblong and somewhat pointed at one end and often smaller. These are astringent persimmons and are most often dried to remove the astringency They can often be seen hanging on strings along country roads with the whitish coating on them, commonly mistaken as mold, but is actually the sugar which has risen to the surface, once the peel is removed. The second type, sweet persimmons, are known as amagaki in Japanese are native to Japan. The oldest variety, Zenjimaru was named after the temple where it was discovered nearly 800 years ago. Amagaki can be eaten raw when still crispy with a texture similar to a crisp pear. The health benefits of kaki are numerous. Naturally high in potassium, similar to bananas and avocados, kaki contribute to cardiovascular health. Also high in anti-oxidant manganese and beta-carotene, which has been linked to reduction in some forms of cancer. “All the better to see you with… “, kaki also contribute eye health as they are loaded with vitamin A and zeaxanthin, an antioxidant which research suggests reduces macular degeneration and cataracts. If that weren’t enough, fresh kaki are also loaded with B-vitamins and loads of vitamin C.
Fresh kaki are usually eaten in hand, simply peeled and sliced into bite-size pieces. There are (minimally) seeded varieties and seedless varieties, often available for as little as ¥100. Dried kaki, called hoshigaki, in Japanese are the dried astringent persimmon or shibugaki. Often enjoyed just like other dried fruit, they are quite delicious and very sweet as the sugars have concentrated. Hoshigaki are also used in many Japanese traditional sweets known as wagashi. 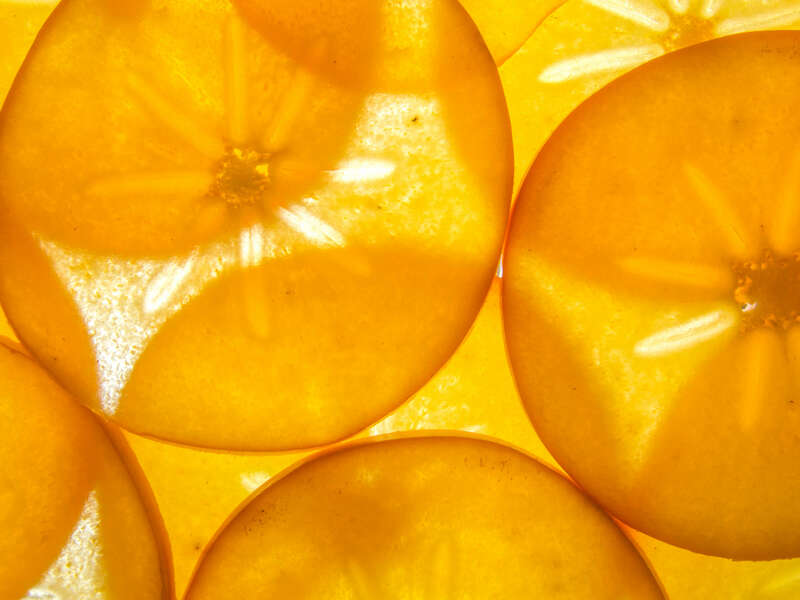 Because of their intense sweetness, hoshigaki are often used as a benchmark for wagashi. Anything sweeter than hoshigaki is considered overwhelming. The beautiful strings of hoshigaki are also associated with good luck and are popular as part of important decorations around the New Year holiday. 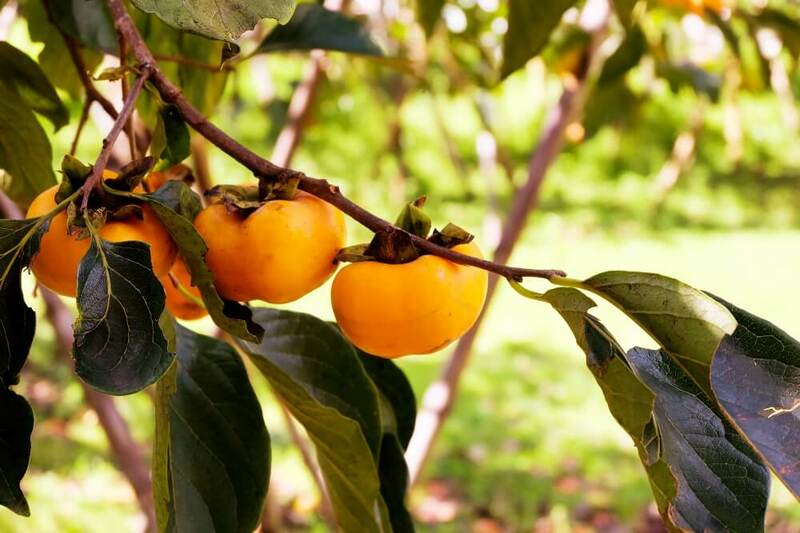 Leaves from the persimmon tree are also used as tea, and known to contain high levels of pro-vitamin C which does not degrade during the brewing process. Kaki are easily obtainable and easy to prepare. They should be eaten with a day or two as they tend to ripen very quickly. Explore the seasonal flavors of Japan for yourself on one of our food tours in Tokyo, Kyoto and Osaka.